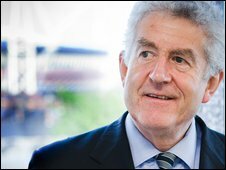 The first test of public opinion for the three candidates hoping to take over when Rhodri Morgan steps down has been carried out in a survey. The YouGov poll asked people how they saw the contenders of Labour leadership faring in the top job. 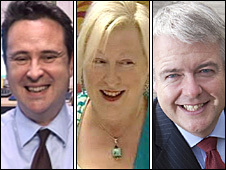 Counsel General Carwyn Jones, Health Minister Edwina Hart, and Huw Lewis, AM, are standing. The winner will replace Mr Morgan as Labour leader when he steps down in December. One of the questions asked was how they think each candidate would do as first minister. The internet poll by YouGov is the first major test of public opinion for the three candidates. The results of the poll also showed 63% of people said Rhodri Morgan had done a good job, with 19% believing he had done a bad job and 17% don't know. In reaction to the survey, a spokesman for Carwyn Jones said: "The real votes that count in this election are those of party members and those in the affiliated organisations in which the ballot has not yet started. "What this poll does, however, is to confirm our view that Labour needs a leader for the whole of Wales." Edwina Hart said: "This straw poll shows quite clearly that people know me and know what I stand for. "As a minister you have to take tough decisions which not everyone may agree with - but I stand by those decisions because I believe they are in the best interests of the people of Wales. "I'm very heartened to find as I meet Labour people face to face during this campaign that I am building up a great level of support." A spokesperson for Huw Lewis said: "These figures really chime with our own analysis and it shows that everything is still to play for. "Our figures have consistently shown that we are ahead with the membership and the broader Labour family; our extensive phone contact has shown us that, and these figures would seem to underscore where our strengths are. "People respond positively to Huw, in north Wales, in west Wales - right across the country there is a genuine and growing connection with his message. "Whilst other candidates currently have slightly better recognition, that is not translated into popularity. "People who meet Huw and hear him speak respond well to him, that is why it has always been our objective for Huw to speak to as many members as possible - he really is the campaign's greatest asset."